For punching one player and hitting before kicking another, Cristiano Ronaldo is suspended for only two matches, as the report from referee Alejandro Hernandez failed to specify the violent conduct, instead simply writing down he sent off the Real Madrid star. Technicalities shouldn’t matter, but ridiculous governing bodies which unfortunately are plentiful in European football live by them. Because there was no reported violent conduct despite what millions saw on their TV screens time and time again through replays, Ronaldo walks away with a minimal punishment for acting like he’s in an MMA ring instead of a football pitch. It’s good to have the right kind of people pulling the right strings for you, as it turns out. It’s hard to say if the punishment was only two matches because of the star power of Cristiano Ronaldo, Real Madrid being who they are or simply the incompetence of the La Liga itself in handing out the correct punishment. It doesn’t matter. It turns out slapping, punching and kicking a player is worthy of only two matches outside. That is what happens when the rules make no sense, and what everyone can see with their own two eyes through the TV cameras takes a backseat to the opinion of a referee in a matter that needs no opinion or bias. Conveniently, Ronaldo will be back to play for Real Madrid in the derby against Atletico. For someone who has said a number of times how officials have an agenda against him and his club, he just got a huge rescue from one. If this was the first time Ronaldo did something like this, maybe the two-match suspension would have made sense. 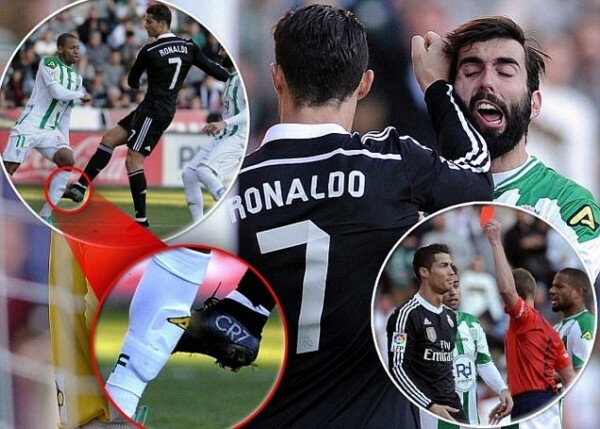 But Ronaldo, just like Luis Suarez, has a history of lashing out violently at players, doing it once every few years. He just has the right name, face and plays for the right team to make it actually matter.